Federal has combined features from their premium defense products with components from their budgets lines to bring shooters this highly affordable and flexible ammunition. 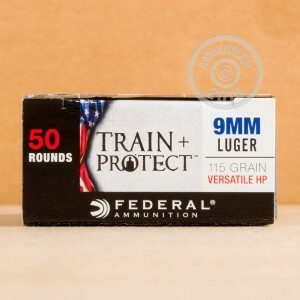 These 9mm Luger rounds from the Train + Protect line are intended to be a one-stop option for high volume practice as well as for concealed carry and personal defense. As such, each round bears Federal's VHP (versatile hollow point) projectile which bears resemblance to the classic Hi-Shok load and is intended for smooth feeding and reliable expansion upon impact with threatening targets. During entry, the bullet's expansion will help slow its velocity which results in great energy transferred to vital areas behind the initial layer of clothing and bone. 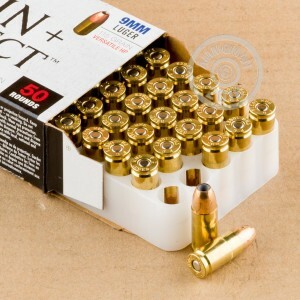 With its 115-grain bullet, shooters can expect this ammunition to fly flatly and produce manageable felt recoil; this is also a common weight for the 9x19mm caliber and can be trusted for dependable operation in a wide range of pistols and carbines. Each projectile is crimped into a reloadable brass casing that is equipped with a non-corrosive Boxer primer that won't leave behind heavy metals or caustic salts. Federal's experience dates back to 1922 and allows them to tailor the load for consistent performance on the range and on the street. Their components are made entirely in-house at their Minnesota for unparalleled quality control.